Good Morning Everyone! At this very moment, most of you are periodically glancing over at your iPad to read this article as you hurry around your house getting ready for work or school drop-off. Scarf down that protein bar, girl. This does not sound like a very peaceful morning routine, but it’s reality for most of us. They say that mornings can set your mood for the entire day ... if this is true then we've got some changes to make. I used to be just as crazy, running around getting the kids ready for school and trying to get myself ready for another extremely busy day... NOT ANYMORE!! My mornings are peaceful and organized. Not to brag, but you'd think I had another set of hands. I starting the morning off right, with a fresh cup of coffee and a few minutes of quiet before the kiddos are up! I love coffee mugs with humor or positivity written on them. It is great to have an organizer and calendar... I get away from mu cell phone every once in a while and resort to old school pen and paper. I make notes off what needs to get done and I keep it realistic!! Do not try and over-burden yourself with a week’s worth of errands and chores in just one day. I'm a health freak and I love vitamins, but once I get busy I tend to forget them! 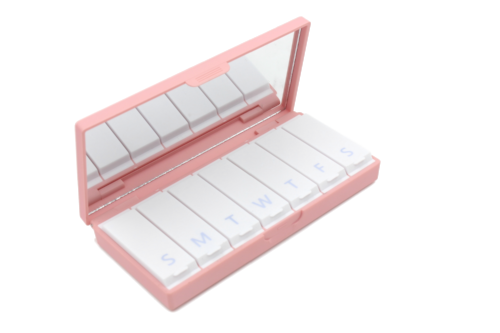 PROBLEM SOLVED when I bought the cutest little pill box to help me always remember what I need to take. SHOP IT HERE! With my busy schedule and frequent travels, it's super easy to get ready for the day and skip my health supplements. Make sure to keep your morning routine simple and positive, this is the best chance to have "you time" throughout the day.